Enigmatic channeled information concerning highly advanced ancient healing arts practiced in the Great Pyramid of Giza, Egypt has been derided and rejected by the vast majority of scientists, who find themselves unable to comprehend that which has been given by psychic sources over the years. Thus we had the Priest's rejuvenation, or the turning back of age as it were... And with these expressions there were those who chose the activities that were set in motion for... the purifying of physical conditions which had been and were being affected by the emotional forces, or the carnal influences about them in the experience. These dramatic healing modalities became the impetus and main focus of the Cayce Hospital in Virginia Beach, VA, offering 'Violet Ray' plasma treatments that were covertly banned by the US government by the most underhanded of means: disinformation, theft, extortion and even murder. All of these activities then became a part of the use of electrical forces for metals and their activity upon same to be used as carbonizing them, or directing them in manners in which they became as magnetic forces for the applications to portions of the body for transmuting or changing the effect of activities upon the physical energies and forces of the body; able to use same as re-ionizing or re-generating the bodily forces themselves. For as the very forces of the bodily functionings are electrical in their activity, the very action of assimilation and distribution of assimilated forces is in the physical body an active force of the very low [frequency] yet very high [amplitude] vibratory forces themselves. These fascinating insights offered by the Source through the medium Edgar Cayce have not been entirely understood until the present exposé. Cayce's identification of "the combination of sodas" applied to the skin for alkalizing the human body refers specifically to the ancient Ayurvedic use of plant ashes for bodily purification, closely associated with the Divine influence of Indra, the deified planet Jupiter. Through bioelectrification in the HHO plasma chambers of the pyramids at Giza, Egypt, the powerful force of electroporation was applied to infuse sodas from plant ashes throughout the tissues of the body, effectively restoring the sensitive pH equilibrium that, when skewed to the acidic side of the spectrum, plays a major role in disease proliferation. Russian scientists discover that treating cells with cold plasma leads to their regeneration and rejuvenation. This result can be used to develop a plasma therapy program for patients with non-healing wounds... Non-healing wounds make it more difficult to provide effective treatment to patients and are therefore a serious problem faced by doctors... Treatment of non-healing wounds by conventional methods is very difficult, and in some cases impossible. 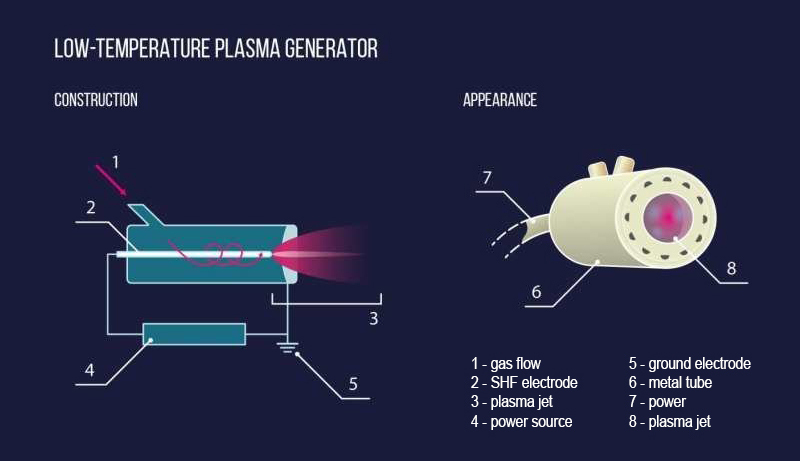 Cold atmospheric-pressure plasma refers to a partially ionized gas --the proportion of charged particles in the gas is close to 1 percent, with a temperature below 100,000 K. Its application in biology and medicine is possible through the advent of plasma sources generating jets at 30-40°C. The researchers also performed an assay of the senescence-associated Beta-galactosidase, which is measured at pH 6.0. The concentration of this enzyme in a cell increases with age. Plasma treatment significantly reduced the content of this substance in the samples. This, together with a prolonged exponential growth phase of the culture, suggests a functional activation of cells --their rejuvenation. "The positive response to plasma treatment that we observed could be linked to the activation of a natural destructive mechanism called autophagy, which removes damaged organelles from the cell and reactivates cellular metabolic processes," says Elena Petersen, a co-author of the paper and the head of the Laboratory of Cellular and Molecular Technologies at MIPT. Plasma treatments induce the regenerative cellular process of autophagy, by which cells effectively remove damage organelles within the body's cells, thereafter regenerating fully functional organelles to restore proper cellular functioning and reducing the presence of Beta-galactosidase. These breakthrough findings provide solid scientific evidence for highly advanced cellular healing information given through trance medium Edgar Cayce, confirming sophisticated regenerative functions of the world's pyramids. Q: (L) You mean the occipital ridge? >Q: (L) How did they physically go about performing this act? What was the mechanism... ? Q: (A) ...When we were talking about phi and Mandelbrot, you mentioned the name 'Carboni. (L) And you also mentioned the name 'Carboni' to Santilli, saying that this group was behind the Molise Institute. Q: (A) But, I still don't understand what is the story with this Carboni that was mentioned in a quite unexpected way, in relation to phi? A: Phi is a key component to the puzzle with regard to gravity waves. Carboni relates to one of the "keepers of the castle," so to speak. Q: (A) So, this is a kind of a foundation, yes? A: Yes, but this is dangerous to fool with, unless with care! Figure it out yourself? O.K. Publicize it? Be oh so careful. Magnetic fields relate. Mineral properties... Study these with regard to your gravitational questions. What compounds balance material space? Which ones reflect this property on your locator? Q: What does the rest of the DNA code for that is not coding for structural genes... ? Q: Truncated flow of what? Q: Okay. Truncated flow of liquids. I'm not even sure what that means. (A) Maybe something was flowing and something cut it off and stopped it and it cannot be developed. It means that something was cut. (L) Does truncated flow mean a flow of liquid that has been stopped? A: Yes. Because of design alteration! Q: Is this liquid that has been truncated a chemical transmitter? Q: And would this chemical transmitter, if it were allowed to flow, cause significant alterations in other segments of the DNA? Q: So, there is a segment of code that is in there, that is deliberately inserted, to truncate this flow of liquid, which is a chemical transmitter, or neuropeptide, which would unlock significant portions of our DNA? A: Close. Biogenetic engineering... Orion STS designers. Q: Okay, can you tell us what this specific liquid or transmitter was truncated? A: Think of the most efficient conductor of chemical compounds for low wave frequency charge. Q: (A) Well, gold is one... (L) Acetylcholine? A: Closer. It is a naturally bonding combination. Q: (L) Well, I'll have to research it. The fact is, we've got 3 billion base pairs... do some of these so-called segments of "junk DNA," if they were activated, would they instruct chromosomal replication to take place with more than 23 pairs as a result? Q: Was my insight that I had one night that, at some point in time something may happen that will turn genes on in our bodies that will cause us to physically transform, an accurate perception of what could happen at the time of transition to 4th density? A: Change to broader receivership capability. Q: (L) What is your receiver? The physical body? A: Mind through central nervous system connection to higher levels. The clues to advanced information regarding the mechanisms of higher consciousness offered by the Cassiopaeans during these precious contacts have not been deciphered by the medium Laura Knight-Jadczyk or her husband, physicist Arkadiusz Jadczyk. However, this line of inquiry has inspired several research directions that have taken shape over the many years since its online publication in 2001. Astonishingly, the Cassiopaean contacts actually provided significant clues referencing the special role of carbonic acid within the DNA core, under high-energy conditions related to exposure of the human body to 4th-density HHO plasma environments. This elusive molecule (H2CO3) has become the focus of much scientific research in recent years, revealing a great variety of chemical reactions that are essential to various natural environmental processes that balance and sustain our planet. Atmospheric carbon dioxide also enters water directly, dissolving to form carbonic acid (H2CO3). This dissociates into hydrogen (H+) and bicarbonate (HCO3-) ions, then into more hydrogen and carbonate (CO32-) ions. Carbonate ions combine with positively charged ions, such as calcium (Ca2+), forming salts, some of which are insoluble, such as calcium carbonate (CaCO3). In the oceans the formation of calcium carbonate is exploited by animals and some single-celled plants, but whatever the route by which it forms, calcium carbonate tends to accumulate in sediments in shallow water (below about 4km, at a level called the carbonate compensation depth, the low temperature and high carbon dioxide saturation of sea water cause calcium carbonate to dissolve). In mineralogy, it has long been known that carbonate minerals kept in acidic environments dissolve and release carbon dioxide. This process of weathering impedes efforts to preserve buildings made from carbonates. Only recently was it recognized that carbonic acid may be a relatively stable intermediate as a surface-adsorbed species in the presence of acidic gases, but only in case of dry conditions near 0% relative humidity. Once the humidity increases to up to 5%, the surface-adsorbed H2CO3 immediately decomposes to carbon dioxide, leaving behind a Ca(OH)(CO3H) surface. In marine science, this link between carbon dioxide and acidic behaviour is of importance in understanding ocean acidification and dissolution of carbonate minerals induced by uptake of anthropogenic carbon dioxide from the atmosphere. In physiology, the kidneys and lungs work together to maintain a blood pH of 7.40_0.05 by balancing carbon dioxide and bicarbonate levels in the bloodstream. In case this balance is disturbed, acidosis (pH<7.35) or alkalosis (pH>7.45) can result. For example, when one hyperventilates, carbon dioxide is lost, which shifts the equilibrium to the left ("alkalosis"). In Earth's atmosphere it is thought that carbonic acid may be formed in the upper troposphere, most likely in cirrus clouds. Cirrus clouds typically occur in heights between 8 and 12 km, where one finds temperatures around 250 K and a pressure around 250 mbar. Following Hage et al., carbonic acid can be sublimated and recondensed without decomposition into CO2 and H2O. The temperature and pressure range relevant for the sublimation in the laboratory has been 180 to 220 K and 10-7 to 10-5 mbar. In our atmosphere we find regions with this temperature in a height of about 15 to 20 km, which is already above the highest cirrus clouds. Looking for a region with a pressure around 10-5 mbar, we have already to go up to heights over 120 km. Although we expect carbonic acid to be found even at higher temperatures and pressure, like in the cirrus clouds, the collision rate is expected to be much higher leading to a much lower abundance of carbonic acid. Thus, it might be very challenging to detect carbonic acid in our atmosphere. 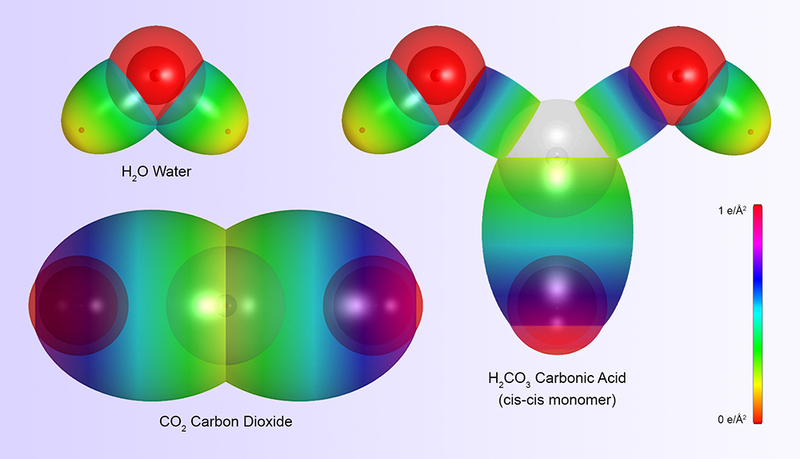 Additionally, the detection is complicated by the fact that the spectroscopic lines of carbonic acid are not in a preferable part of the spectrum. 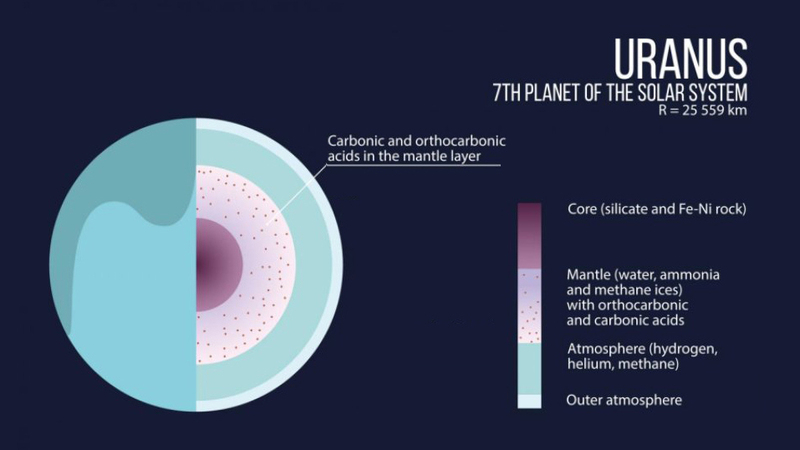 Scientists have discovered that the depths of Uranus, Neptune and their satellites may contain extraordinary compounds, such as carbonic and orthocarbonic acids. It is no accident researchers have chosen these planets as a subject for their research. These gas giants consist mainly of hydrogen, carbon and oxygen, which are the three cornerstones of organic chemistry. "The smaller gas giants --Uranus and Neptune-- consist largely of carbon, hydrogen and oxygen. We have found that at a pressure of several million atmospheres unexpected compounds should form in their interiors. The cores of these planets may largely consist of these exotic materials," says Head of Laboratory of Computational Materials Discovery, Professor Artem R. Oganov. The great diversity of natural chemical interactions resulting in the formation of carbonic acid extend throughout the solar system in many hidden contexts that are only now coming to the attention of scientists, due to its evasion of spectrographic detection. The other major factor influencing its low detectability is its unstable behavior under the nominal conditions of our terrestrial environment. Startling scientific information obtained through the psychic medium Laura Knight-Jadzcyk suggests that nominal DNA states presently observed and understood by scientists represent a degradation that was overcome by the technological achievements of the global Atlantean civilization, which flourished from ~74,000 to13,000bp. The original names given by Edgar Cayce for the two main pyramids of Giza, as the 'Temple Beautiful' and the 'Temple of Sacrifice', reflect their primary functions for upgrading DNA conferred enhanced beauty by genetic purity, as well as cellular and anatomical regeneration. 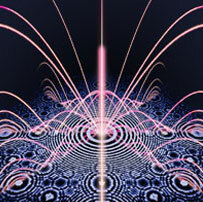 High-intensity electromagnetic fields generated by the piezoelectric transduction of planetary infrasound by the metallic geopolymer stones of the pyramids induced autophagy and DNA enhancements through extreme conditions of cellular ionization that have not yet been replicated under laboratory conditions. Knight-Jadzcyk's channeled material implicates the ionizing conditions of HHO plasma chambers within the pyramids as instigating dramatic DNA alteration by inducing the flow of carbonic acids in the DNA core, thereby regenerating lost segments of genetic code. Recent scientific findings concerning the resonant dynamics of single molecule conductance directly supports this unconventional hypothesis. The single-molecule conductance of hydrogen-bonded and alkane systems are compared in this theoretical investigation. The results indicate that for short chains, the H-bonded molecules exhibit larger conductance than the alkanes. Although earlier experimental investigations attributed this observation to a large density of states (DOS) corresponding to an occupied molecular orbital below the Fermi energy, the current work indicates the presence of a Fano resonance in the transmission function in the vicinity of the Fermi energy. The inclusion of this observation is essential in understanding the behavior of these systems. We also address the characteristics of the H-bond for transport and provide an explanation for the presence of a turnover regime wherein the conductance of the alkanes becomes larger than the H-bonded systems. Incidentally, this feature cannot be explained using a simple DOS argument. 'Fano resonance' refers to a class of resonant scattering phenomena that give rise to an asymmetric line shape due to interference patterns between a background and the scattering process itself. The crucial importance of Fano resonance in many natural processes has only recently been revealed, yet the application of these concepts to the conductance of carbonic acid molecules along the chain of hydrogen bonds lining the core gap of the DNA helix is hypothesized here for the first time. 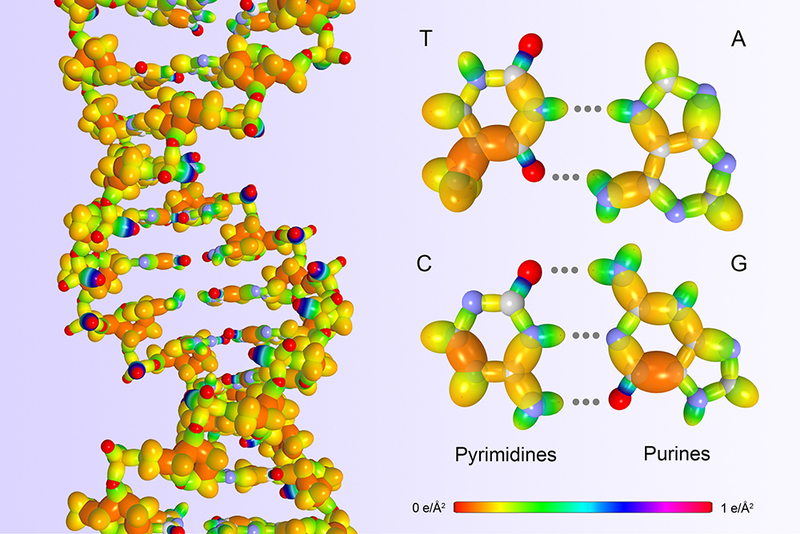 Significant advances in the mathematical modeling of the complex structures of DNA molecules inform a broader understanding of the possible metafunction of the genome. Dr. R. Mills, founder of Blacklight Power (recently renamed Brilliant Light Power), has released the September, 2016 Edition of 'The Grand Unified Theory of Classical Physics' offering high-precision calculations of bond energies within the bases of the DNA helix. Extreme ionization may induce formation of carbonic acid according to Huber et al., and induce single molecule conductance according to the latest findings of Wimmer et al. 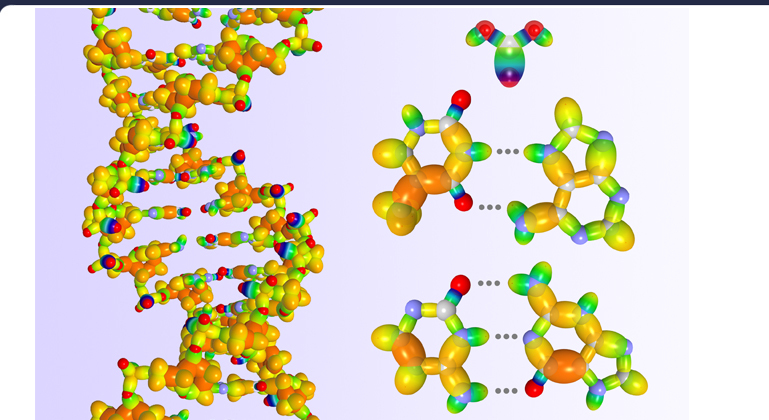 Millsian molecular modeling provides an energetic scale by applying the visible color spectrum to the relative bond strengths between each atom comprising the helix. The DNA 'core' is indicated by the chain of hydrogen bonds lining the gap between base pairs (marked by dotted lines in grey, above); thymine (T), adenine (A), cytosine (C) and guanine (G). 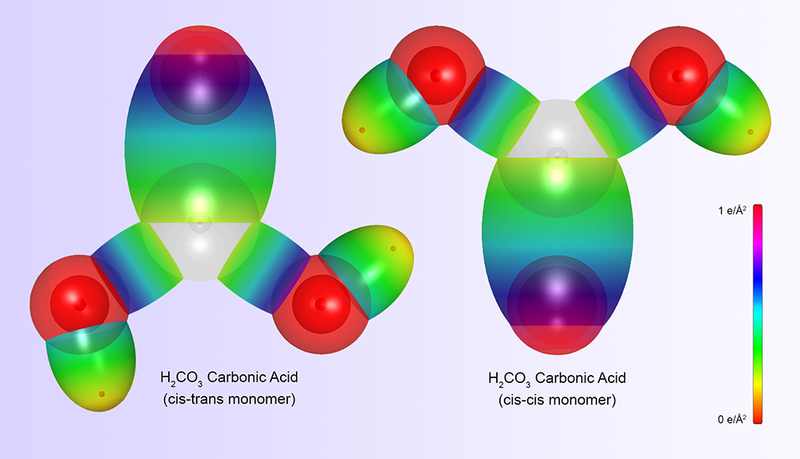 Conductance of a stream of carbonic acid molecules along this H-bond chain by extreme cellular ionization offers a concise explanation for the genetic modifications described by the Source speaking through Cayce and Knight-Jadzcyk. Profound clues offered through the Cassiopaea Experiment point to the resonant plasma regeneration process now known to induce cellular autophagy throughout the human body, as the highest form of genetic modification, once achieved by Atlantean scientists at the Orion Pyramids of Giza, Egypt. These unparalleled descriptions of the rejuvenating effects of 4th-density HHO plasma environments inspire a restoration of advanced Atlantean biophysical knowledge that promises a remarkable advancement for human consciousness and longevity that will likely exceed the extended life expectancy enjoyed by Atlantean initiates at the height of their spectacular achievements ~30,000 years ago. Cosmic cycles of ~309,000 years, marked by the dispensation of galactic superwaves that periodically bathe our planet in infrasonic resonance, have been identified by the Source as inducing a full restoration of the original 135 chromosome pairs of the human genome , thereby conferring holographic consciousness and median terrestrial human lifespans exceeding 400 years!